Veteran actress Sadhana Shivdasani, known for films like “Mera Saaya”, “Wo Kaun Thi” died today in Mumbai after a brief illness. She was 74. Sadhana, who is credited for introducing the fringe hairstyle popularly known as “Sadhana cut” died at a private hospital in Mumbai, sources said. Her body was taken to her residence in suburban Mumbai where Bollywood personalities, including her former colleague and friend Waheeda Rehman, went to pay their last respects. Born in 1941 in a Sindhi family, she was named after her father’s favourite actress Sadhona Bose. Her father and actor Hari Shivdasani were brothers. Hari’s daughter is actress Babita Kapoor. Sadhana was the only child and and her mother home-schooled her until she was eight. In 1955 she played a chorus girl in the song “Mur mur ke na dekh mur mur ke” in Raj Kapoor’s “Shree 420”. She made her full-fldged film debut in the first ever Sindhi film “Abana”. She debuted in Bollywood along with Joy Mukherjee with the movie Love in Simla. Alongside Love in Simla, Sadhana was signed by acclaimed director Bimal Roy for his satirical film on Indian democracy, Parakh. She portrayed a simple village girl in this multi-award-winning film. In 1961’s other hit Hum Dono she played the love interest of Dev Anand. This black-and-white film was colourized and re-released in 2011. The Rafi – Asha duet “Abhi Na Jaao Chodkar” remains evergreen. In 1962, she was again paired with Dev Anand in Asli-Naqli by director Hrishikesh Mukherjee. The same year saw director-screenwriter Raj Khosla cast her opposite Joy in his musical film Ek Musafir Ek Hasina. In 1963, Shivdasani played her first role in a technicolour film Mere Mehboob directed by H.S.Rawail. The film was the “Blockbuster” of 1963 and ranked in the top 5 films of the 1960s. The scene where Rajendra Kumar encounters Shivdasani for the first time and sees her eyes through her burqa stands as one of the most remarkable scenes of Hindi film industry. Shivdasani in 1964 played her remarkable double role in the first of the suspense-thriller trilogy, Woh Kaun Thi?. This white-sari-clad performance opposite Manoj Kumar earned her first Filmfare nomination as Best Actress. Through this role she got to be part of Lata Mangeshkar – Madan Mohan’s all time classics like “Naina Barse” and “Lag Ja Gale”. The film was a box office “Hit”. Raj Khosla cast her in two more succesaful mystery films, Mera Saaya (1966) and Anita (1967) thus making her famous as the “Mystery girl”. Mera Saaya, a box office “Super Hit” courtroom drama film again saw her playing a double role, now opposite Sunil Dutt. The song “Jhumka Gira Re” sung by Asha Bhosle and composed by Madan Mohan saw Shivdasani perform dance steps choreographed by Saroj Khan. Khan was then an assistant to dance director Sohanlal. The song became so popular that excited audience in cinema halls used to throw coins at the screen. The film also had the classic songs “Naino Mein Badara Chhaye” and the haunting theme song “Tu Jaha Jaha Chalega, Mera Saaya Sath Hoga”, both voiced by Lata Mangeshkar. Her other notable works in 1960s include performances in Parakh, Ek Musafir Ek Hasina, Gaban, Manmauji (1962), Ek Phool Do Mali, Rajkumar (1964 film), Dulha Dulhan, Asli-Naqli, Hum Dono (1961 film), Budtameez and Mere Mehboob. 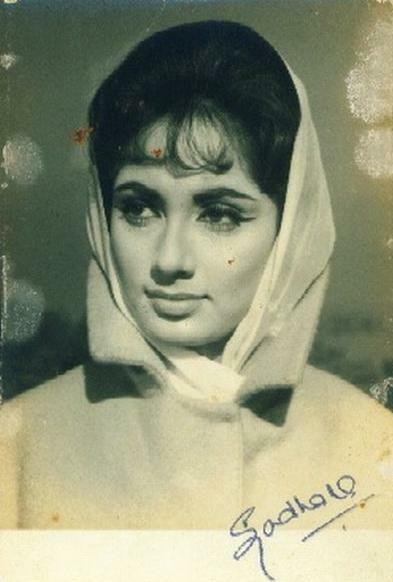 Shivdasani got her second Filmfare nomination as Best Actress for the role of Meena in Yash Chopra’s directorial saga Waqt (1965). She stood out in Bollywood’s first ever ensemble cast by bringing along the fashion of tight chudidar-kurtas. The film proved to be 1965’s “Blockbuster”. Sadhana Shivdasani introduced the fringe hairstlye in Indian film industry in her first film Love in Simla. R. K. Nayyar, director of the film and her future husband, suggested the fringe style in order to make her forehead look narrower. Shivdasani says, “They tried to stick a strip near the hair-line, but it didn’t work out.” Nayyar then suggested she go for the fringe style as was then sported by the Hollywood actress Audrey Hepburn. The fringe soon became popular and a fashion fad in the 1960s. The style was copied by girls in India and is still known by the same name. Shivdasani is also credited for bringing into fashion tight chudidar-kurta. She went with this concept of gracefully changing the traditional loose salwar kameez to her director Yash Chopra for 1965’s film Waqt. Chopra felt insecure and thought that it would not be accepted. But Shivdasani with the help of her fashion designer Bhanu Athaiya showed him a sample, which he liked. The trend lasted well in the 1970s and can be seen to be adopted by many actresses. May Her Sould Rest In Peace !